Mu ping starts with pork shoulder, which has become my cut of choice for pork skewers for both its flavor and ability to remain nice and juicy on the grill, even if cooked a tad too long. It isn't the easiest of cuts to work with though due to its extensive amount of fat and sinew, which requires time to trim around. 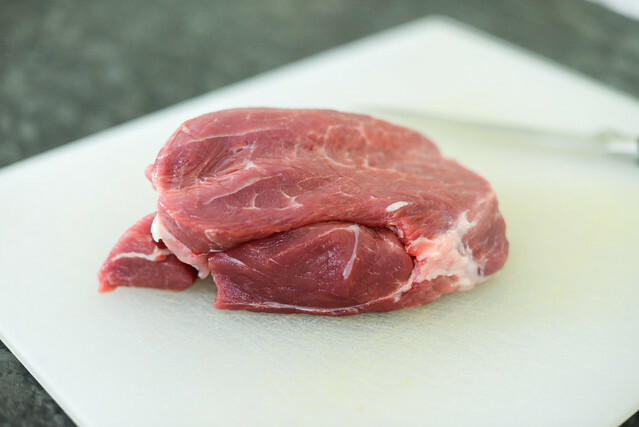 I've found a shortcut though by picking up my meat at Asian butches, who usually have pork should divided in separate pieces, which allows me to buy ones that have less fat and gristle, increasing the speed of prep and the ratio of meat I can get out of one chunk of meat. 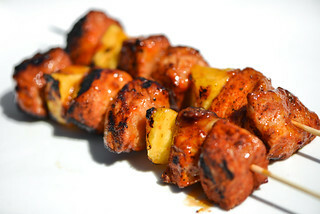 Even with an ideal cut, pork should can still turn out overly chewy when cut into the usually 1-inch cubes that are standard in my skewers. 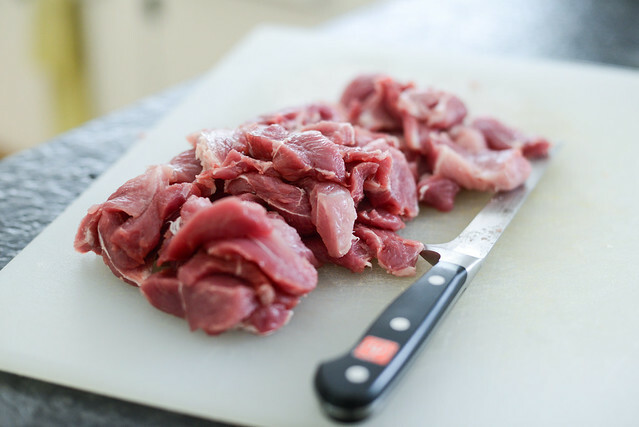 Slicing the meat into thinner stripes shortens muscle fibers and helps ensure a more tender end result, but the problem with smaller bits of meat is quicker cooking and faster drying out. To find a happy medium here, I cut my shoulder into thin strips around two-by-one inches, which I could later fold over when skewering to create pieces around one-inch square. The main reason I actually picked out mu ping as a project was I already had all the ingredients on hand for a Thai-themed Meatwave. 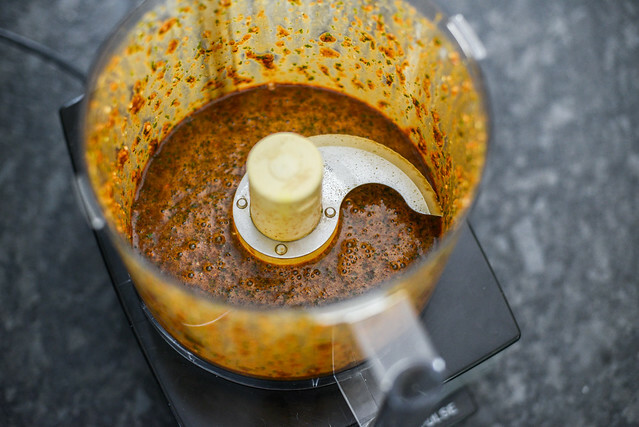 So it wasn't much extra work or expense for me to make the marinade that started with cilantro, garlic, palm sugar, dark soy sauce, oyster sauce, and white pepper which I pulsed in a food processor until a roughly chopped paste formed. I then added in coconut milk and pulsed again until it just came together, making sure not to puree it completely because I wanted to retain some of the texture of the chopped ingredients. Next I transferred the pork to a Ziploc bag and poured in the marinade. Since this wasn't a highly acidic marinade, I was able to let it safely sit overnight, mainly for convenience of day-before prep—a shorter four hour soak would work totally fine here. 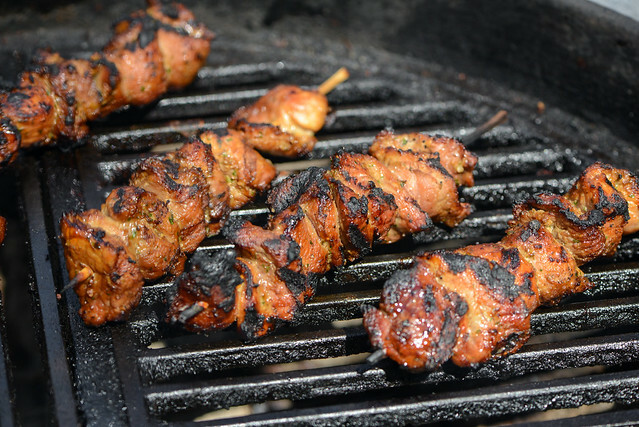 Then I skewered them up as I originally intended—folding each strip of pork in half and threading them onto the stick. 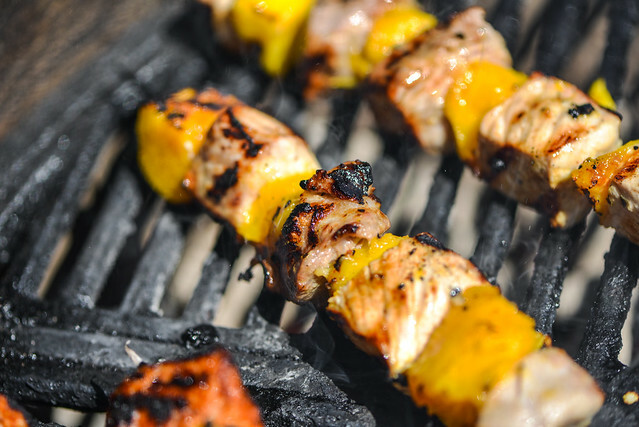 This created a skewer of pretty evenly sized pieces of pork, which is ideal for even cooking on the grill. The fire I cooked these over was fresh, and the scorching heat left an attractive char that was heavier than if I had cooked them over a medium hot fire. This also meant they grilled up really quickly for me, around two minutes per side, but over a more moderate fire these would probably take around 10-12 minutes total to cook through. The end result left me wondering why I ever had a problem with Thai skewers in the first place. Of course I had never tried mu ping before, but the savory flavor with a nice kick of garlic is something I enjoyed so much that I couldn't believe I hadn't let myself expand my horizons sooner. Like with so many Thai appetizers, they only got better with a sauce. I had both a sweet and spicy sauce and jaew—a dried pepper sauce—which was the one I personally preferred in this application. Now I'm left wondering if there were other things like this delicious mu ping that I've embarrassingly limited myself from having...anything else you think I need to try? 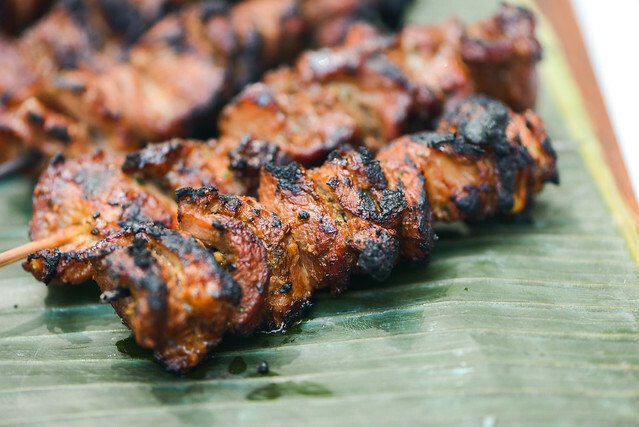 Savory with a nice kick of garlic, mu ping is one tasty Thai pork skewer. 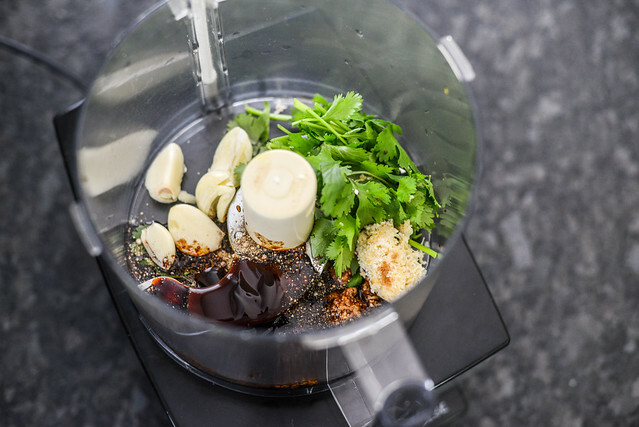 Place cilantro, garlic, sugar, soy sauce, fish sauce, oyster sauce, and white pepper in the workbowl of a food processor fitted with a steel blade. Pulse until cilantro and garlic and roughly chopped and thick paste forms. Add in coconut milk and pulse until mixture is homogeneous. Place pork slices in a large resealable plastic bag. 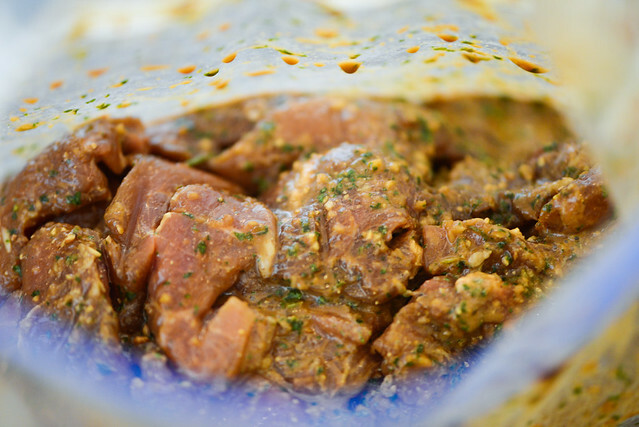 Pour marinade into bag and seal, removing as much air as possible. Place in refrigerator and marinate for at least 4 and up to overnight. 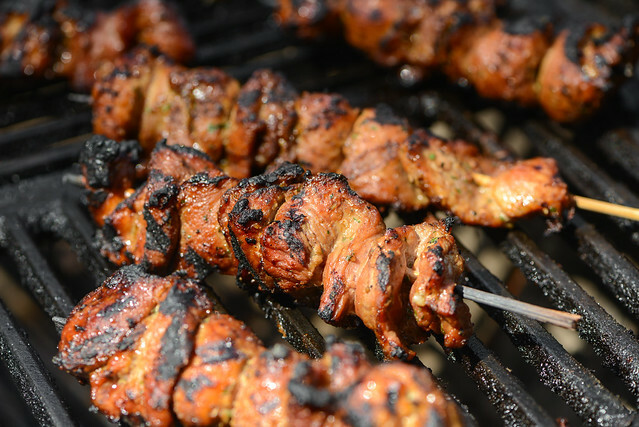 Thread pork onto skewers, folding long side of slices over to create an approximately 1-inch square. Light one chimney full of charcoal. When all charcoal is lit and covered with gray ash, pour out and spread the coals evenly over entire surface of coal grate. Set cooking grate in place, cover grill and allow to preheat for 5 minutes. Clean and oil the grilling grate. 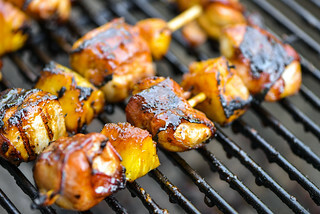 Grill skewers until well browned on all sides, 3-4 minutes per side. 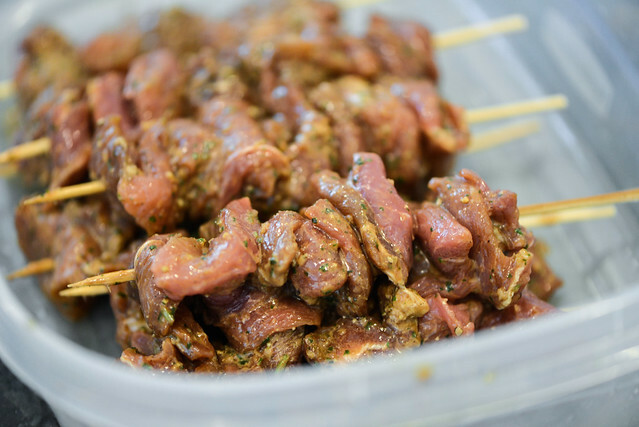 Transfer skewers to platter and let rest for 5 minutes. Serve immediately. Hi Josh!!! Any chance you might also share the recipes for your dipping sauces for this dish?